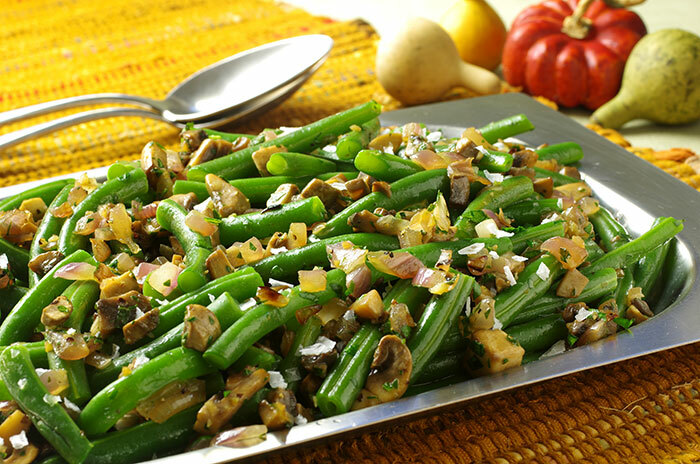 Green beans seem to be a family favorite. 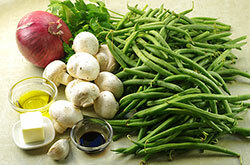 I like to serve this simple yet flavorful side dish instead of the creamy green bean classic. It is perfect for Thanksgiving dinner since it can be doubled easily and transports well. 1. In a medium skillet, heat 1 tablespoon of the oil over medium heat. Sauté the mushrooms for 3 to 4 minutes, or until they change color and soften. Remove to a bowl. 2. Add the remaining 1 tablespoon oil and 1 tablespoon of the butter. Sauté the onion for 7 to 10 minutes, or until it is soft and begins to caramelize. Add the vinegar and cook, stirring constantly, for 1 minute. Add the garlic and sauté for 1 minute. Add the garlic and sauté a for 1 minute. Add the mushrooms, parsley, and salt and pepper to taste. Remove from the heat. 3. Bring a large saucepan of water to a boil. Salt the water, immerse the beans in the boiling water, and cook for 5 to 7 minutes, or until tender but slightly resistant. Drain and place in a serving dish. Toss with the remaining 1 tablespoon butter and salt and pepper to taste. Sprinkle evenly with the topping and serve immediately. Make 1 day ahead through step 1, cover, and refrigerate. Reheat the topping in a skillet before serving.